Allen Business Machines has one priority above all others: We want to help increase our clients’ productivity. That’s why we came up with our wide-ranging, highly beneficial Productivity Formula. With our available solutions, you can streamline your daily processes. You’ll be able to cut expenses, reduce waste and do more work than you may have thought possible. Nothing helps your business reach its true potential better than our comprehensive Managed Network Solutions. ABM can help you build your IT network from the ground up and maintain it for maximum uptime. We don’t just keep your business in business—we give you the opportunity to make your business grow. We can watch over your systems and fix issues before they can hamper your productivity. Having trouble with your desktops or your network? Our highly trained, 100% local IT Help Desk is here 24/7 to resolve your problems. Ensure that you can recover your critical data if a disaster damages your systems. Develop a strategy for building, maintaining and upgrading your IT infrastructure. 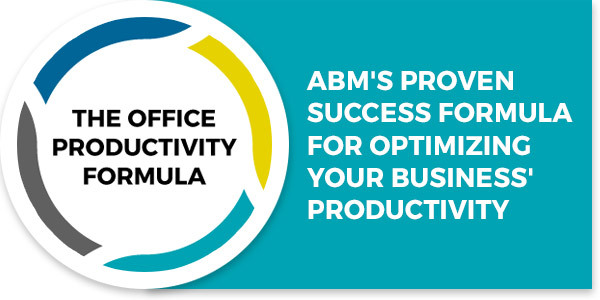 ABM’s outstanding selection of multifunction printers and other office equipment enable you to increase your productivity. You can also take advantage of our Managed Print Services to get the most from your devices. 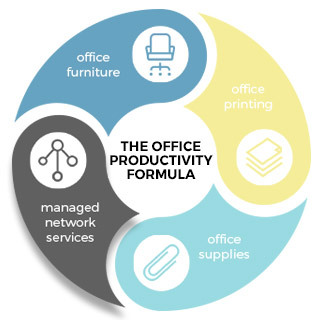 With our available office furniture, you can work better and more comfortably. Check out our stock of supplies from 3M, HP and other leading brands.